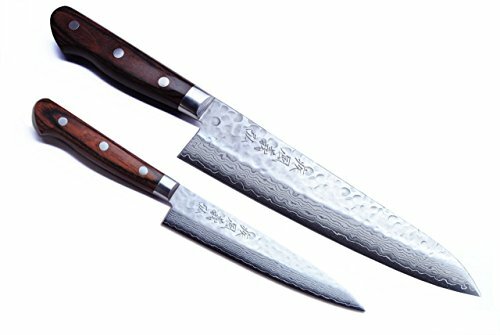 This set includes our popular hammered Damascus Gyuto chef knife and petty knife. This standard size Gyuto is a great chef knife. The petty is perfect for working with smaller ingredients or delicate foods. Hammered Damascus Knives have 16 layers of VG-10 Gold, a Japanese super steel which is strong stain resistant and best cutting edge retention. It has Chromium and cobalt which makes the knives stain-resistant and durable. Hammered Damascus knives are thin and lightweight. The blades are super sharp, easy to sharpen and maintain. The handles are made of premium Mahogany. The handles are durable and comfortable to hold. The Gyuto is a general-purpose chef knife. Used for cutting meat, fish, and vegetables. It has a double-edge blade, making it versatile for use. Not to be use on frozen foods. The Petty is small chef knife that is convenient to use when working with small ingredients or delicate work. Japanese knives should always be sharpened and honed on premium quality Japanese water stones. A good quality Japanese water stone not only is the best surface to sharpen and maintain the blade of your knife, but it is also the best tool to preserve and take care of the high quality steel that it is made of. View More In Gyutou Knives. If you have any questions about this product by Yoshihiro, contact us by completing and submitting the form below. If you are looking for a specif part number, please include it with your message.